There was a bloody fight between Igbo traders and the Hausa traders at Panteka market, a major spare-parts market in Kaduna state following the naming of two dogs, ‘Muhammad’ and ‘Ibere’ by both an Igbo trader and a Hausa trader respectively. According to reports, the Igbo trader named his newly bought dog after the Hausa man who bears the same name ‘Muhammad’ in retaliation to the Hausa man who first bought his own dog and named it ‘Ibere,’ after the Igbo trader. “Since the boy named the dog after the trader, the trader had warned him on several occasions to rename the dog, but the owner of the dog Muhammad refused. 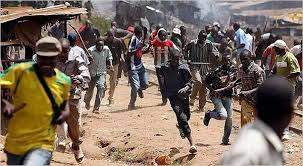 The Igbo trader, Ibere also bought a dog and named it Muhammad, this is when all hell was let loose,” Aminu said. The reports also said that the market has been closed down by men of the Nigerian Police who stormed the area to restore law and order after the fight broke out.